Make sure you purchase an owner’s title insurance policy to protect your property rights. Find out how for a one-time fee an owner’s policy can protect your important property rights for as long as you or your heirs own the property. Also, learn about common and real-life title problems that could impact your property rights. A professional will search public records for debts, legal judgments and other homeownership issues to give you peace of mind in your investment. A title professional will also look for covenants, conditions and restrictions and other types of easements. When an issue is discovered, the title professional will take care of it—typically without you even knowing about it. If the problem is not easily resolved, you will be notified. Title searches reveal problems on more than a third of all residential real estate transactions. Some title issues are not apparent from a review of the public record. Title insurance provides coverage for undisclosed title defects that might later result in a claim. This work is necessary to issue the insurance policy and often includes the cost of conducting a title search, examination, correcting errors, issuing the policy, and, frequently, the settlement or closing for consumers. An owner’s policy protects against these additional items. An owner’s policy of title insurance provides the homeowner peace of mind about their legal rights to real property. If you have a question or concern about your rights, promptly notify the title insurance company whose name appears on the title policy. 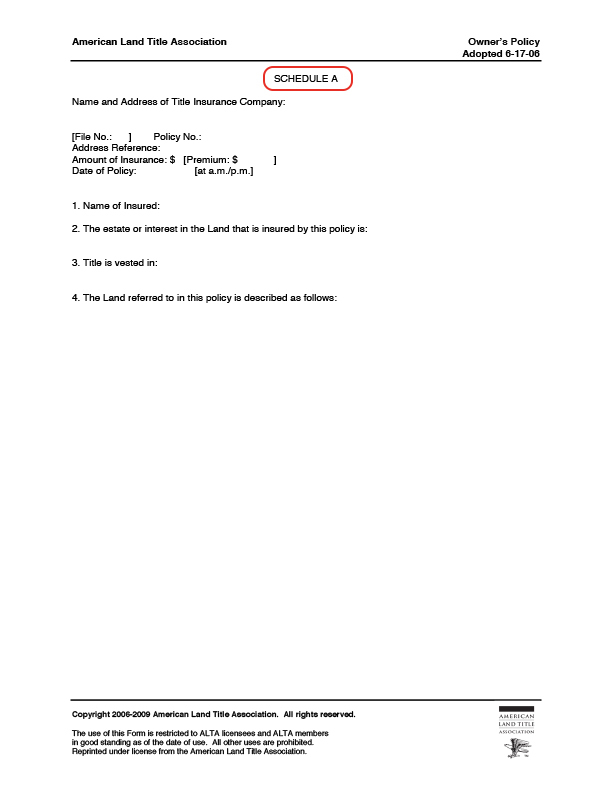 The title policy includes instructions for contacting the title insurer. This information is usually at the end of the “Conditions and Stipulations” section within the policy. Unable to locate your policy or unsure whether you purchased a policy? Contact the title company, title agent, settlement agent or attorney that handled your purchase and inquire about your coverage. You can determine if you have title insurance coverage by reviewing the Closing Disclosure provided at the closing of your purchase. For example, charges for an owner’s policy can be found under the “Other Costs” section on page two of the Closing Disclosure. Contact information for the title insurer may also be found online or with your state department of insurance. 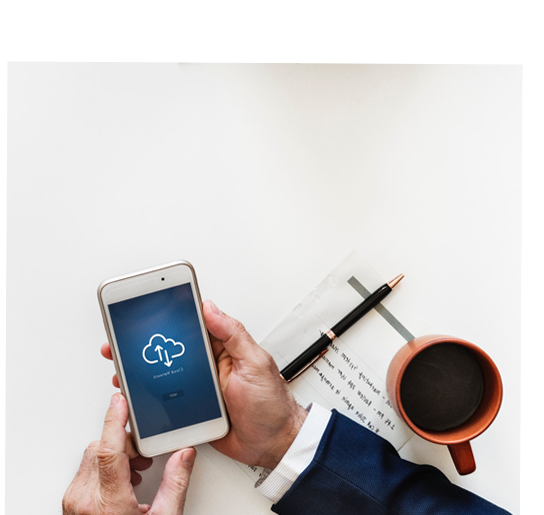 When giving notice of a potential claim to the title insurer, include the property address, a brief statement of the question or matter, copies of any claims documents received, and a copy of your owner’s policy (if available). Remember, the broad coverage of title insurance includes protection against frivolous claims, or title issues that may not present an immediate problem. It’s best to contact the title insurer promptly, as soon as you have any question or concern about your legal rights with insured land. The cost of a title insurance policy relative to the cost of a property transaction is about one-half to one percent of the purchase price. The premium is based on the purchase price of the property, generally determined by the value of the land plus any improvements. Title insurance industry practices vary due to differences in state laws and local real estate customs. Who pays for the owner’s policy varies from state to state. On the East Coast, the buyer typically pays. The seller normally pays on the West Coast. A discount may be available when both the owner’s and loan policy are purchased simultaneously. Ask your title company who pays in your area and if a discount is available. It’s also important to note that the cost for title insurance may include other services provided by the title company such as the title search or conducting the closing. When comparing one rate to another, be sure to get detailed information on what is included in that rate, so you are comparing equally. Title insurance rates are regulated by state insurance departments. In addition, title insurance and real estate closing practices are regulated by the Consumer Financial Protection Bureau (CFPB). State regulators in some states, including Florida, New Mexico and Texas, require all companies to charge the same rate for title insurance. Other states such as New York, Pennsylvania, New Jersey, Ohio and Delaware also have uniform rates. When shopping in these states, you will receive similar rates for title insurance from each company. There are many factors to consider when selecting a title insurance company, such as local expertise, service standards, market conduct and commitment to the community. Be sure to shop around and ask questions to make sure you’re comfortable with your title company and that you know what’s included in the cost. Many consumers rely on their real estate agent or mortgage lender for a recommendation for a title company, however, it important that all homebuyers remember that they have the right to shop for title insurance and to choose their own title agent or company. right of access to and from your land. Review your owner’s policy or ask your title agent about the covered risks included in your policy. Exclusions limit the coverage of the policy. They deal with issues that are outside the control of the title company. 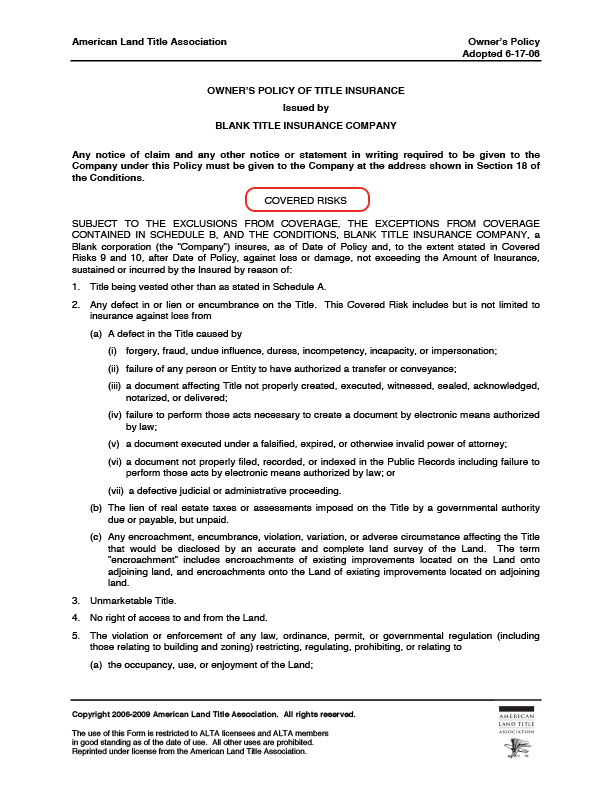 The ALTA owner’s policy contains five exclusions, which include matters such as governmental regulations on the land and eminent domain, as well as title matters created or agreed to by the insured, or title defects known to the insured but not disclosed in writing to the title company prior to the date of the policy. The policy does not insure against any defect or title issue that is created or attaches to the property after the date of the policy. Also, the policy does not insure against the effects of bankruptcy law on the transaction creating the insured interest. Schedule A sets forth the specific information on the title and policy, such as the date of policy, the amount of insurance, the insured, the legal description of the land insured by the policy and the estate insured, such as fee simple or leasehold. Schedule A must be attached to the policy in order for the policy to be valid. Schedule B lists the various exceptions to the title that the title company found when it performed its title search. Common exceptions would be things such as prior unreleased mortgages on the property, easements, taxes, restrictions on the use of the property, and any other limitations on the title such as homestead rights or survey issues if no survey has been performed. 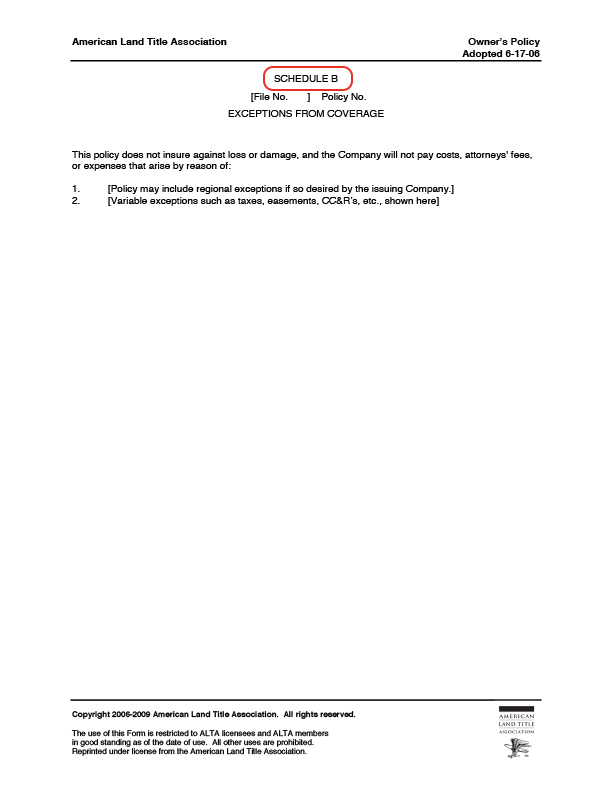 By listing various items as exceptions, the title company is telling the insured that these items are not covered by the title policy, and that the title company will not pay a claim or defend against a claim based on these excepted items. This section outlines the relationship between the insured and the title company. 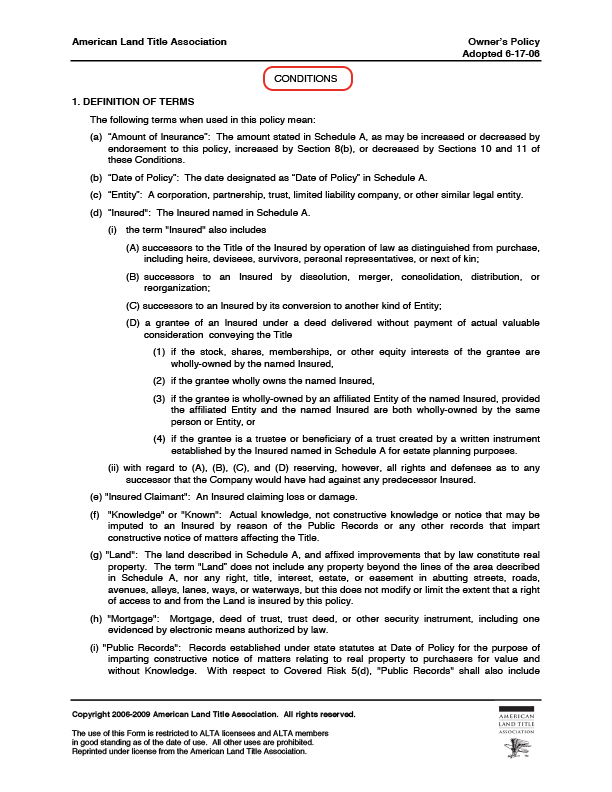 Paragraph 1 contains the definitions of certain terms used in the policy. Terms such as “Insured,” “Insured Claimant,” “Knowledge” and “Public Records” are defined so as to eliminate any ambiguity. 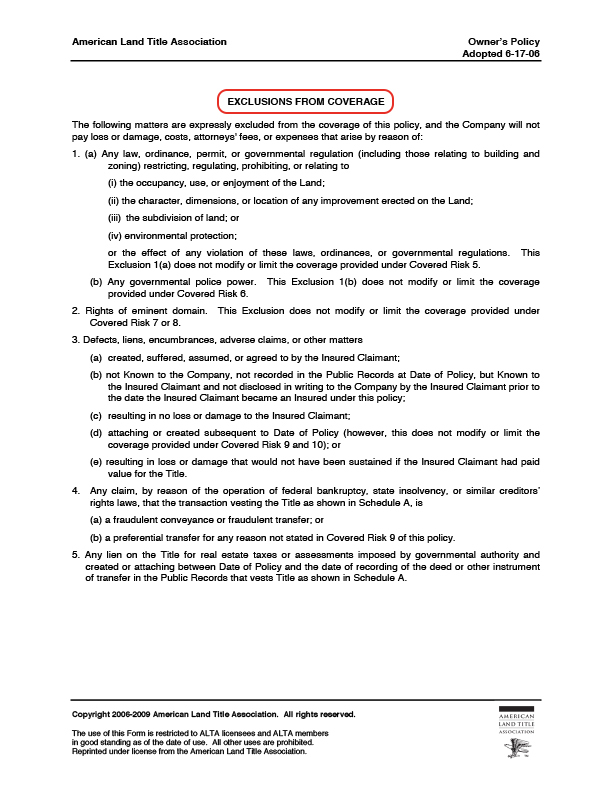 There are several different paragraphs setting out how a claim under the policy is handled, including how to provide notice of a claim, what is required to prove loss, and the requirement that the insured must cooperate with the title company in the handling of the claim. Click here to learn how to file a claim. The Conditions describe the rights of the title company to pay or settle the claim, and the determination, extent and limitation of liability. Most policies also contain a paragraph that allows the insured or the title company to demand arbitration if the amount is under $2 million. A couple purchased a home from their landlord, who had taken out a $419,000 loan to purchase the property along with several other properties. The lien was missed during the title search, so the lender paid the landlord instead of paying off the lien. Despite making their payments, the bank sent a letter saying the home would be auctioned. Because the couple purchased an Owner’s Title Insurance Policy, the title company paid the lien and the husband and wife kept their home. A Texas-based builder sold first-time homebuyers houses that were encumbered by undisclosed liens. When Casa Linda Homes subsequently failed to pay its undisclosed debt, the creditors who were owed money then instituted foreclosure proceedings or filed lawsuits against the homebuyers. Because the deals were “seller financed,” the builder didn’t require the buyers to purchase title insurance, which would have protected the buyers. REMINDER: For a one-time fee, an owner’s policy provides protection for as long as you or your heirs on the property. In addition to protecting your investment, an owner’s policy also covers the legal fees and the cost of defending your property rights. New homeowners want to focus on buying new furniture for the living room or painting walls, not worrying about having to pay a bill left behind by a previous owner. There are two types of title insurance policies. As mentioned, the owner’s policy protects the homebuyer. A loan policy protects the lender. Most lenders usually require a loan policy when they issue you a loan. The loan policy is based usually on the dollar amount of your loan. It only protects the lender’s interests in the property should a problem with the title arise. It does not protect the buyer. The policy amount decreases each year and eventually disappears as the loan is paid off. An owner’s policy, usually issued in the amount of the real estate purchase, provides protection for as long as you or your heirs have an interest in the property.